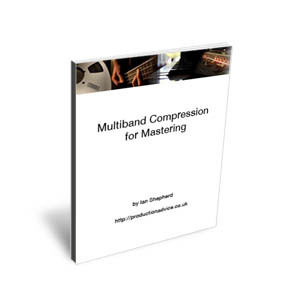 Last week Ian Shepherd (productionadvice.co.uk, mastering engineer and friend of AGZ) announced the release of his first instructional E-Book Mastering with Multiband Compression. There is a basic and enhanced edition. The enhanced version has a bonus 1hr tutorial video, and audio examples for just $10 more. If you prefer not to donate, click here. Ian sent me an advance copy and I was quite impressed. I sent him a short review for his sales page. And this is the truth. Ian’s approach is different than the way I’ve taught myself to use multiband compression over the past couple years. I haven’t been doing it completely wrong but I now know why on several occasions it hasn’t worked as well as I’d hoped. Multiband compression was never as transparent as I’d like and it was so easy to overdo it. I know this is a common complaint about multiband compression and Ian’s book has the solution. The starting point, strategy and tips will change the way you misuse multiband compression. These days almost all digital audio workstations have the option to record and operate at 24 bit resolution. In fact it is highly likely that the vast majority of musicians and engineers are already setting their DAW’s up to work at 24 bit. 24 has a number of advantages over operating at 16 bit. I am going to explain a very important advantage which may not be as obvious. It relates to mixing reference levels on your stereo master output bus. Firstly we have to look at record levels because this is where the initial advantages occur. When you record at 24 bit resolution you have a much greater theoretical dynamic range. This means that the noise floor of the recording in the digital realm is much lower than recording at 16 bit. It is theoretically 48 dB lower than at 16 bit. So as a consequence there is no need to record anywhere as hot as when using 16 bit. In fact, a suggested recording level for 24 bit would be to have an average signal level of -18dBFS. You could even have peak signals at this level without detriment to audio fidelity. With peaks at -18dBFS at 24 bit your noise floor is still theoretically 30dB better than that at 16bit. An additional bonus effect is that to obtain peak levels of -18dBFS your mic preamps, compressors and mixer channels will be operating at a lower electrical level which means a cleaner and clearer recording.